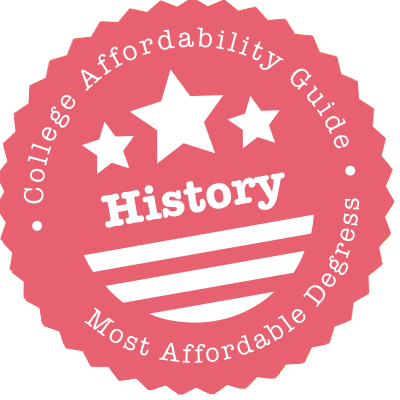 Scroll down to see the most affordable history degrees, as well as info on the different types of history degrees and history program accreditation. The Department of History at UC Irvine offers a Bachelor of Arts in History, as well as a specialized track for students interested in a teaching career. The Master of Arts in History program gives students the option of writing a thesis or passing a comprehensive exam in order to earn the degree. Students accepted to the Doctor of Philosophy in History program can choose to specialize in an area studies field or a thematic field. The department offers area studies in Asian, European, Latin American, Middle East and African, U.S. and world history. Thematic fields vary and may include environmental history, global migrations, and gender and sexuality studies. Graduate students can apply for the Dickson D. Bruce Graduate Research Award ($2,000). The University of Minnesota-Duluth is home to the Northeast Minnesota Historical Center, an educational research center that supports conferences and publishes "Upper Midwest History." The school offers a Bachelor of Arts of History with concentrations in geographic regions of Africa, East Asia, Europe, the Middle East and United States and chronological classifications of ancient, pre-modern and modern times. Students can take part in an intensive honors program and teach in overseas programs in England and Russia. A certificate program in Museum Studies provides the foundation for work in public historical institutions. Internships are encouraged. The department awards include the UMD Bathory/Lane Reaching Higher Scholarship ($500), the UMD Maude Lindquist Scholarship ($1,000) and the UMD Washburn Memorial Award ($1,000). At Texas A&M, the History Department has created 12 thematic clusters for history classes, ranging from the U.S. in the World to Race, Ethnicity and Migration. These thematic clusters allow students seeking a Bachelor of Arts in History to concentrate on an area that is of most interest to them. The university also grants a Master and Ph.D. in History. Areas of strength in the doctoral program include modern U.S. history, diplomatic and military history, and modern Europe. The university offers undergraduates many opportunities to conduct and present research, including sponsoring an annual paper competition and offering grants for research and for study abroad programs that can range from a few weeks to a semester in length. The History Department at Rutgers University offers a variety of specialized graduate programs, including a new Master of Arts in Global Comparative History, which draws students such as school teachers deepening their knowledge and individuals interested in pursuing a Ph.D. The New Brunswick campus is also home to the doctoral program in history. Ph.D. students are usually funded for five years, including assistantships and fellowships. Undergraduate history degrees are granted by all three Rutgers campuses, and Camden and Newark both have an accelerated BA/MA in History, which reduces tuition costs by allowing students to count some credits toward both degrees. The University of North Carolina-Chapel Hill partnerships with the National University of Singapore and King's College in London offer unique study abroad opportunities for history students to explore historical topics in-depth. The school offers a Bachelor of Arts, Master of Arts and Ph.D. in History. Undergraduate concentrations include Ancient and Medieval History; Latin American History; African, Asian and Middle Eastern History; Global History; and United States History. Graduate concentrations include Ancient History; Asian History; European History; Global History; United States History; and Military History. Professional internships are available at numerous area museums, archives and preservation societies. The school offers merit- and need-based scholarships and offers financial support for study abroad. UCLA offers a Bachelor of Arts in History degree through the Social Sciences Division. Graduate students are admitted only to a Doctor of Philosophy (PhD) in History program, but they can earn a Master of Arts (MA) in History degree en route to their PhD. The MA in History is not offered as a terminal degree. The graduate program offers the following fields of study: Africa, ancient history, China, Europe, Japan, Jewish history, Latin American, medieval history, Middle East, South and Southeast Asia, United States, and the history of science, medicine, and technology. In addition, there are currently three areas of emphasis (formerly referred to as cross-field clusters): modern world economics history, Atlantic history, and the history of women, men, and sexuality. UIC's Department of History gives out three annual honors to undergrads majoring in the discipline. The Goodman Award goes to the top student and is worth $800. At the graduate level, the department gives out several teaching assistantships to those pursuing an MA or PhD in History. The best are the History Doctoral Awards, which are "enhanced" assistantships that guarantee full funding and a stipend for four years. Short of those, grad students can apply for internal fellowships and awards based on their academic interests. For example, the Gilbert Fellowship, worth $4,900, is earmarked for PhD research in Europe. The History of Poland Scholarship, estimated at $13,000, gets even more specific. Members of the history faculty at Baruch College are active in research and publishing, but they are also dedicated to making history accessible. In addition to their teaching duties, they work with the student History Club to organize film showings, lectures and even a historical scavenger hunt. Many advanced classes focus on topics such as transnational issues. Students earning a Bachelor in History at Baruch can put their historical research skills to work and earn academic credit by interning at a museum or historical organization in the New York City area. Among the agencies Baruch students have worked for are the Staten Island Museum, the New York Transit Museum and several consulates or international chambers of commerce. History isn't meant to be studied so much as explored. That's the idea behind the Evalyn Clark Memorial Travel Fellowship, which rewards sophomore and junior History majors with funds for summer research trips. Graduating seniors can win any of four awards, including the Zen Memorial Prize for the best thesis and the Ward Prize for excellence in European or English history. Though courses necessarily cover topics from a range of geographical regions, the department breaks them up by areas of interest - one such area is Power, Politics, Labor and Capital. The Department of History aims to give incoming PhD candidates funding for four to five years. Admitted students should expect some combination of fellowships and assistantships tied to teaching responsibilities. As for undergrads, UC Riverside gave the most financial aid to freshmen on average of any public university in 2017. For those getting a Bachelor of Arts in History, that financial aid might come from the Hart Endowed Scholarship Fund, awarded to meritorious students. Or it might come from the Noller Endowed Undergraduate Student Award, which goes to freshmen and transfer students with financial need; awardees must be first-generation students and aspiring teachers. The Bachelor of Arts in History degree at UC San Diego has three fields of emphasis: geographic (Africa, Ancient Mediterranean, East Asia, Europe, Latin America, Middle East, and United States), thematic (science gender and sexuality, race, ethnicity, and migration, and war, revolution, and social change), and pre-professional (business, education, global/transnational, law, and medicine). Concentration areas for the Master of Arts in History degree include East Asian history, European history, Jewish Studies, history of science, and history of the United States. The Doctor of Philosophy degree has the same concentration areas as the MA program with the addition of ancient history, Latin American history, and Middle Eastern history. Doctoral candidates receive financial support in terms of a stipend and fee and tuition remission. The University of Minnesota-Twin Cities works with 12 research centers on campus to offer enriching interdisciplinary workshops and lectures throughout the year on a range of topics. These centers also provide opportunities for student research projects, service learning and internships. Study abroad opportunities are available around the world. The Department of History offers a Bachelor of Arts degree with a curriculum that offers flexibility to seek a dual or double major. The Ph.D. program, with an embedded Master of Arts, allows for specialization in 12 areas. In addition, graduate students can choose an MA or Ph.D. in Philosophy. Scholarships include the Hedley Donovan Scholarship ($8,000), the Talle Family Merit Scholarship ($12,000), and the Norman Moen Scholarship ($500). The Department of History at Rutgers University offers an undergraduate major and minor in history, as well as history master's and doctoral programs. The undergraduate history major requires 36 credits of major coursework covering subjects such as United States history, European history and premodern history. Students are also required to complete a history seminar and a history workshop. The Master of Arts in Global and Comparative History is a flexible program designed for students who are working full or part-time, with classes offered in the late afternoon or evening. The curriculum is designed to meet the career goals of those working as history teachers and those looking to pursue a Ph.D. The Ph.D. in History is designed for students who are ready to dedicate five-years to full-time study, although some part-time students are admitted. The Department of History and Social Studies at Buffalo State offers degrees in history, museum studies, and social studies education. The Bachelor of Arts in History is a 39-credit program that requires classes in American, European, and world history and a research seminar. The Master of Arts in History is a 30-credit program that requires all candidates to write a master's thesis. The Master of Arts in Museum Studies prepares students to work in a museum or other cultural institution. Museum Studies candidates choose among three tracks: Collections Management and Curatorial; Visitor Experience and Education; or Museum Operations. The department offers social studies education programs at the bachelor and master's levels and also offers a minor in history. SUNY Oswego offers a Bachelor of Arts and a Master of Arts in History. Undergraduate history majors are required to complete at least 39 credits in history classes. All history majors select an area of specialization and take four courses in that area, including a capstone seminar. Specialization areas can have a geographic or thematic focus, and students select an area in consultation with their adviser. Candidates for a master's in history can choose to specialize in European, American, global, or women's history. The History Department also offers minors in African/African-American studies, gender and women's studies, global and international studies, history, Medieval and Renaissance studies, museum studies, and Native American studies. The History Department at the University of California Berkeley ranks No. 4 in the 2018 U.S. News listing of Best Grad Schools, and it's ranked No. 1 in Asian history and cultural history. Students in the bachelor's program are required to develop a field of concentration, taking at least four courses that are related by period, geographical area, or theme. Undergrads have the chance to publish outstanding history research in Clio's Scroll, the Berkeley undergraduate history journal. Excellent students may be invited to join the campus chapter of Phi Alpha Theta, the history honor society. The Ph.D. program is highly selective, with fewer than 10 percent of applicants accepted. Ph.D. candidates typically receive funding for six or seven years. The History Department at the University of California Davis is known for its research into the history of the American West. Undergrads can choose from five areas of concentration that are based on geographic regions. Students in the Ph.D. program choose a major or minor area of interest (from eight geographic regions or science and medicine) and can also minor in environmental history, world history, or cross-cultural women's and gender history. Several endowed scholarships are reserved for history majors, including the Siverson Scholarship and the Huberty Scholarship. Most students who enter the graduate program receive funding through a combination of employment and fellowships. U.S. News ranks the graduate history program at No. 32 in its 2018 Best Grad Schools list. Westfield State is home to both the Historical Journal of Massachusetts and the Global Women's History Project. The former is a biannual peer-reviewed journal covering all things local, while the latter brings female guests from every continent to conduct workshops and participate in an oral history project. Because both offer for-credit internships every semester, the school's History majors have a unique opportunity to put theory into practice. Students looking to parlay their degree into a different type of career can pursue the history licensure track, which qualifies them to teach 5th to 12th graders. Such students can still do an internship, but must also complete a practicum at a local middle or secondary school. Students who major in history at Barnard College select an area of focus, which could be the history of a region, a particular period in history, or a theme in history. Thematic concentrations offered include urban history; intellectual history; rights, law, and the state; empires and colonialism; race and ethnicity; gender, sexuality, and the family; markets, money, and labor; science, technology, and environment; the Atlantic world; religion, belief, and values; premodern history; war and revolution; or international and global. To earn their bachelor's degree, students must complete at least 11 history courses, with eight of the courses in their area of concentration. Students may count history classes taken at Columbia. History majors must also write a senior thesis. History majors at SUNY Oneonta can earn a degree in history or in Adolescence Education: Social Studies. The History Department encourages student research, and grant funding is available for students with faculty sponsorship. Students who assist with faculty research are eligible for academic credit, and students can also apply to be research assistants for the quarterly journal of the New York State Historical Society, edited by History Department faculty. Internships with local museums and other facilities are another way students get both academic credit and hands-on experience. The college has an active history club and a chapter of Phi Alpha Theta history honor society. The Nicholson Scholarship is a renewable grant for an incoming history major. Students seeking an undergraduate degree at Appalachian State can earn a BA in History, a BS in History that prepares them to teach secondary social studies, or a BS in History with a concentration in applied and public history. The applied history concentration is designed for students interested in careers such as historic preservation or cultural resources management. Students work with a faculty adviser to craft the exact concentration that meets their needs. Appalachian State also offers a Master's of Arts in History, and teaching and applied history degrees at the graduate level. The History Department awards scholarships including the Dr. Robert D. Warren Scholarship for History (about $3,000) and the Professor Thomas K. Keefe History Scholarships (about $1,300). The University of Massachusetts-Amherst Department of History offers a Graduate Certificate or Master of Arts in Public History thanks to partnerships with museums and archives in the region and the support of other academic programs on the campus. The department also offers a Bachelor of Arts, Master of Arts and Ph.D. in History with courses covering a variety of historical fields from American History and European History to the History of Science. The summer program at Oxford University has been offered for 50 years, and internships are available in a variety of fields that put a student's research and communication skills to use. Scholarships include the Ermonian Scholarship and the Giguere Scholarship in History. History students at St. Cloud University learn to bring the past into the digital age by creating digital exhibits for museums and transcribing and encoding historic documents for online research. Undergrads can study abroad in areas of historical significance such as England, France, Korea and Germany. Students seeking a Bachelors in History can choose a pathway to prepare them for graduate studies in management, law, international business or history. Master's students can earn a traditional history degree or one in public history, preparing them for a job in a museum or historical organization. Scholarships include the Alton C. and Haidako H. Wolfer Endowed Scholarship in History ($500) and the James and Muriel Grunerud Scholarship in History (amount varies). Wayne State College's Department of History, Politics and Geography offers Bachelor of Arts and Bachelor of Science degrees in history, as well as a history education subject endorsement. The B.A. and B.S. programs require 36 credits of coursework that covers subjects such as world civilizations and American history. Students are also required to complete a three-credit social sciences research seminar. Students who choose to earn a history endorsement complete 42 credits of coursework and must complete an endorsement in another subject area besides history. History majors can participate in student organizations like the History Club and Phi Alpha Theta, the history honorary society. The Bachelor of Arts in History program at CSU Long Beach gives students the option of specializing in two or three fields of study. Students can choose from the following fields: Africa and the Middle East, Ancient and Medieval Europe, Asia, Latin America, Modern Europe, United States, and World. There is also a Master of Arts in History degree available. A History Teaching emphasis was added to the MA program in fall 2014. This emphasis is designed for students who plan to pursue careers as K-12 history teachers after graduation. History undergraduates, as well as graduate and credential students, are considered for the Richard and Louise Wilde Award. One $7,000 and three $2,000 awards are given to qualified students each year. History majors at Castleton University can apply for the more rigorous History Honors Program if they plan to pursue graduate study in history. All students seeking a Bachelor of Arts in History must produce an original piece of historical research. The study of history is part of the Department of History, Geography, Economics, and Politics, and history majors benefit from the interdisciplinary nature of the department by taking courses in all those social sciences. Castleton history students take part in civic engagement projects such as helping the local historical society, and local museums and historical sites often hire students as interns. History students may apply for the Robert L. Patterson & Warren L. Cook Memorial Scholarship, a merit award. The doctoral program offered by Iowa State's History Department bestows a Ph.D. in Rural Agricultural, Technological and Environmental History, or RATE. It is the only doctoral program in the country to focus completely on agricultural communities and how they developed and used technology and have been affected by the environment where they are located. Undergraduates can pair their history studies with the requirements for a teaching license, which will qualify them to teach American and world history plus one other social science for grades 7-12. The university provides many study abroad programs that are appropriate for history majors. Undergraduate history majors are eligible for the Frank H. and Ethel A. Spedding Scholarships in Physical Science and History. The Humanities Department at Ferris State University offers a Bachelor of Arts in History, as well as an undergraduate history minor. The Bachelor of Arts in History requires the completion of six core history courses, including coursework in US history, world civilizations, the craft of history and a research course that serves as a capstone. Students are also required to take nine credits of upper-level coursework in both American history and world history. Students in the history major have the option to tailor their studies to a particular area of interest by selecting relevant electives in historical niches such as African American history or the history of science and technology. Additionally, upper-level students have the opportunity to take part in internships and research projects. History students at the University of Florida share research with the Department of History and the academic community through publication of the "Alpata: A Journal of History," an award-winning student publication. The school offers a Bachelor of Arts and Master of Arts in History, with a combined BA-MA program that allows students to complete both degrees in five years. An honors track offers the option of completing an undergraduate thesis. Campus research centers, such as the Center for European Studies and the Reuben O'D Askew Institute on Politics and Policy, provide internship and research opportunities. Students are encouraged to take part in study abroad opportunities, as well. Scholarships include the Phillips Scholarship, the Frank Scholarship and Koleos Undergraduate Research Award. Berea College offers a Bachelor of Arts in History and an undergraduate history minor. The B.A. program requires one core course and seven additional history courses, as well as a capstone course completed in the form of a senior seminar. History students have the opportunity to act as teaching assistants, research assistants or departmental office staff. They also have the opportunity to work with historical artifacts through the Artifacts and Exhibits Studio at the Appalachian Center through school-year work positions or summer internships. Clubs available to history majors include the History and Political Science Club and Phi Alpha Theta, the national history honor society. Through its Division of Human Studies, Alfred University offers an undergraduate major and minor in history. The history major prepares students for careers in education, journalism, law, government, libraries, archives and historic preservation through 34 credits of major coursework, including 26 credits of upper-level courses, eight credits of upper-level American history courses and eight credits of upper-level non-American history courses. The history minor requires 20 credits of coursework, including 12 credits of upper-level courses. History students can also participate in Phi Alpha Theta, the national history honor society. Michigan State University's History Department has more than 40 faculty members who do research in a range of interdisciplinary and trans-regional specialties. Students in the graduate program are expected to choose one primary field of study, such as African-American history, gender history, science and medicine, or Latin American history. They complement that field by studying two secondary fields, including working with faculty outside their primary field. The university also offers a Bachelors in History, and students can earn credentials to teach secondary school history. Michigan State offers many study abroad opportunities and has a number of scholarships for study abroad that history majors can apply for, such as the College of Social Science Study Abroad Alumni Scholarship ($1,500). Queens College offers a bachelor's degree in history and two master's programs with history as a focus. Undergrads seeking a history degree must take 36 departmental credits, including courses in European, U.S., and non-western history. They must also select an area of concentration, such as U.S. history, ancient and premodern history, or gender and history. The Master of Arts in History offers two tracks: a research track for students who plan to earn a Ph.D., and a professional track for students who expect the M.A. to be a terminal degree. Queens College also has a joint degree in History and Library Science which results in both a Master of Library Science and a Master of Arts in History. Cal State Fullerton offers Bachelor of Arts and Master of Arts degrees in history and a minor in history as well. Students who wish to teach history in a middle school or high school setting can take the credential program, which is also referred to as the History Social Science Subject Matter Preparation Program. Students have access to the Center for Oral and Public History where they are trained in the research methods of collecting and interpreting oral histories, as well as in presenting these and other important regional and national stories to the public. Graduate students pursuing a master's thesis or project in oral or public history may be eligible for the Hansen Fellowship in Oral and Public History ($1,500). Brigham Young University-Idaho offers a Bachelor of Arts in History, a Bachelor of Science in History Education or a BS in Social Studies Education with a history emphasis. Students learn to use the tools and methods of historical research as they develop an understanding of the cultural, political, social, religious and economic forces that have shaped the world. The university maintains an active chapter of Phi Alpha Theta, the national history honor society, giving students an outlet to network, learn more about the field of history and prepare for graduate school. Undergraduate history majors at the City College of New York must complete at least 11 history electives. They are encouraged to choose an area of concentration, which could be thematic or geographic, and take at least four electives in that area. The Master of Arts in History allows students to select either a thesis or non-thesis track. The thesis track requires 30 credits and a thesis. The non-thesis track requires 30 credits and two field papers, typically written as assignments for courses. CCNY also offers an accelerated B.A./M.A. in history. Students are invited to join the History Society, a student club that sponsors workshops, guest speakers, and outings to museums in the city. Hunter College offers Bachelor of Arts and Master of Arts degrees in History and in History Adolescent Education. To earn the B.A. in History, a student must complete 30 credits, including a history practicum and a research project that requires the student to work with a faculty member while planning and preparing a history research paper. To earn the B.A. in History Adolescent Education, students must earn six credits in political science and economics, six credits in geography, and 21 credits in history. Students seeking the M.A. in history have four years to complete the program, which includes earning 30 credits and writing a thesis. Faculty areas of specialization include the colonial era, modern China, African-American history, and Latino history. Texas Woman's University offers a Bachelor of Arts in History, a Bachelor of Science in History, and a Master of Arts in History. Students can also pursue teacher certification and pre-law advising. A degree in history provides students with critical thinking, research, and writing skills and prepares students for careers in law, politics, and public services. Students may qualify for scholarships such as the Paul P. and Arlee N. Young Scholarships, the Ada Cade McCury and Martha Faye McCury Savage Endowed Scholarship, the Professor and Mrs. John L. Dawson and Dr. and Mrs. Hubert G. Driggs Scholarship, among others. Students may join Pi Sigma Alpha, the National Political Science Honor Society, and/or Phi Alpha Theta, the History Honor Society. Students interested in history can earn a Bachelor of Arts or Master of Arts in History at Brooklyn College, or they can prepare to teach secondary school history. Undergrads can also minor in Archival Studies and Community Documentation, Asian Studies, or Global Studies through the History Department. Undergrads must complete 36 credits in history, including classes in ancient or medieval history, European history, U.S. history, and transnational or comparative history. Graduate students choose from a wide range of specialties. The M.A. requires students to complete 30 to 33 credit hours of coursework, and students may choose a thesis or non-thesis option. Departmental scholarships include the Jesse Clarkson Scholarship, for a senior who plans to study European history in graduate school. Students pursuing a Bachelor of Arts degree in History at the State University of New York-Plattsburgh have access to the school's collection of archival materials on northern New York state that can provide primary resources for independent research. Students also enrich their education with study abroad, study of a foreign language and culture or completion of related minor. The school offers affiliated programs in Asian Studies, Model Organization of American States, Canadian Studies, Latin American Studies, Religious Studies and a study abroad program in Southern Mexico. Internships are offered in a number of area research libraries and museums. Scholarships include the Benjamin Feinberg Memorial Scholarship and the Martin Hasting Scholarship. The University of North Texas offers a Bachelor of Arts in History, a Bachelor of Arts in History with a Teaching Certificate, a Master's degree in history (both thesis and non-thesis options), and a Ph.D. in history. The department also offers a minor in history as well as five other interdisciplinary minors: Asian Studies, Jewish Studies, Mexican American Studies, Classical Studies, and African American Studies. History majors may be eligible for the CBS Mechanical Scholarship, the Nation's Heritage Scholarship, the J.L. Kingsbury/Troy M. Thomason History Scholarship, the Gus Seligmann History Scholarship, and/or the Daughters of the American Revolution Scholarship. Additionally, the Department of History offers many courses online. The Department of History at Stanislaus offers a Bachelor of Arts in History degree with a curriculum that cover topics such as world civilizations, comparative and global perspectives, the pre-modern era, and research and information literacy. History is offered as an area of concentration for students in the Liberal Arts and Social Sciences programs. Stanislaus also offers a Master of Arts in History degree. This program offers secondary school teaching as an area of concentration. Several scholarships are available to History majors, including the Rasmussen Scholarship (full-time undergraduate students), Wilbur and Vivian Grant Scholarship (full-time or part-time students), and the Frank Holder & John Caswell Award (graduate students). Amounts for these and other Department of History scholarships are determined each year. History graduates are hidden in plain sight throughout the United States. They appear as guides at historic sites, museum curators in great art institutions, diplomats, librarians, archivists, and documentary film producers. They teach humanities to high school kids and lecture on world events to college students. You may even find them in law courts, as judges and attorneys, and in hospitals, as medical doctors. It’s a versatile degree, but it requires a great deal of focus and work experience to use it as the base for a career. If you’re ready to face this challenge, we’re ready to help. In our guide to affordable history programs, you’ll find detailed info on each degree, including descriptions of sample coursework and a list of job opportunities. We explore what regional accreditation means and when you might need to think about licensure or certification. An associate’s degree in history is a 2-year undergraduate program that provides an introduction to core history topics. Associate degrees are often offered at a reasonable price from community colleges. A high school diploma or GED is required to apply. Most students earn an associate’s degree in order to transfer to a bachelor’s degree. If you’re planning to do this, be sure your associate course credits will be transferable to the undergraduate program of your choice. Associate of Arts (AA) in History: General liberal arts degree with history electives. The curriculum for an AA in history is made up of general education requirements (e.g. English composition, math, social science, etc.) and survey courses in all aspects of history. You might study topics such as ancient world history, nation-based history, the history of a cultural group, events such as the Industrial Revolution, war, and globalization, the history of science, and more. Plus you will discover how to conduct historical research via primary and secondary sources. There aren’t many careers opportunities available for history graduates with an associate’s degree. In order to become a teacher, archivist, or journalist, most students decide to earn a bachelor’s degree. Having said that, if you can combine solid work experience (e.g. archival work, government lobbying, etc.) with your AA, you’ll have an advantage over your peers. A bachelor’s degree in sociology is a 4-year undergraduate program that grounds students in the study of history. Bachelor’s programs are available from a wide range of regionally accredited universities and colleges. A high school diploma or GED is required to apply. Bachelor of Arts (BA) in History: Contains more liberal arts courses than a BS. This is the traditional choice for students who are interested in professional school (e.g. law), teacher training, and master’s work after graduation. Bachelor of Science (BS) in Sociology: Contains more college-level science and – possibly – history electives than a BA. Don’t forget that you also have the option to double major. To improve their career options, many students choose to combine history with a job-focused major (e.g. biology for pre-med, government for those interested in politics, etc.). Like other liberal arts, the curriculum for a BA in history will contain general education requirements (e.g. English, math, foreign language, etc. ), coursework in science or humanities, and electives in history. In your third and fourth years, you’ll have more freedom to focus on your area of interest (e.g. history of science, Russian history, etc.). Many schools will also give you the opportunity to work on a capstone project and/or take part in internships. Many BA students earn a history degree in order to prepare for law school – there is no official “pre-law” major and history provides a good foundation in research. Another popular choice is K-12 teaching. We talk more about this option in our section on state licensure. A word of warning – without a healthy amount of relevant work experience, it can be tough to find a job straight after graduation. Because of this, some graduates decide to go to professional school in areas such as library science, international relations, archives management, and museum studies. Although it’s not impossible to become a curator with a bachelor’s, museum curators tend to hold a graduate degree. A master’s degree in history is a 1-3 year graduate program that gives students the chance to pursue advanced research in a specific area of history (e.g. Renaissance history) or study an area of professional interest (e.g. museum studies, archives management, library science, etc.). A bachelor’s degree in history or a relevant major (e.g. art history, archeology, etc. ), is required to apply. Master of Arts (MA) in History: Usually targeted at students who are interested in research careers, community college teaching, or a PhD. Master of Arts (MA) or Master of Science (MS) in Museum Studies: Designed for aspiring museum curators, managers, and employees. Master of Science (MS) in Library Science: Often offered with a concentration in archives and record management. The curriculum for a master’s degree program in history will depend on your concentration. For an MA in museum studies, for example, you might study topics such as museum management, history and architecture of museums, business and marketing, museum interpretation, and museum collections. For an MS in library science, you might take courses on information resources and services, digital media, IT, archives & records management, manuscript preservation, and database design. Some degrees are more research-based than others. If you’re in a traditional master’s program, you will be expected to write a master’s thesis based on original research. If you’re in a professional program, you may be required to complete a capstone project. To be eligible for ACA certification as an archivist, you most hold a master’s degree. If you wish to teach as a history professor at the college/university level and be eligible for tenure, you will need a PhD. A Doctor of Philosophy (PhD) in History is a 3-7 year program intended for students who wish to become history professors and/or pursue high-level research. It is the highest academic qualification one can achieve. Unless you enroll in a combined master’s/PhD program, you will be required to earn a master’s degree before you can apply. In the first few years of a PhD in history, you will usually need to complete advanced coursework in history topics and research methods. You may also be required to take one or more exams. Once you’ve cleared these barriers, you’ll have more opportunity to focus on original research in a topic of your choice. To graduate, you will need to write a book-length dissertation on your research and defend your findings in an oral exam. A certificate in history is non-degree program, roughly equivalent to a minor in a degree, that takes ~6 months – 1 year to complete. These short qualifications are often intended to give you training in specific skills (e.g. archiving) or expose you to fundamental concepts in history. Undergraduate Certificate: Intended to help undergraduates build their knowledge of the field or introduce high school graduates to the study of history. Graduate Certificate: Intended to help graduate students earn course credits for a master’s, advance up the career ladder, hone specific skills, and/or enrich their knowledge of history. Remember that if you wish to apply your certificate credits towards a degree, be sure that your credit hours will be transferable to the program of your choice. Whichever state you live in, we recommend you attend a regionally accredited college or university. Regional accreditation is a “seal of approval” granted to institutions by one of 6 regional accrediting bodies (e.g. North Central Association of Colleges and Schools). You can learn more about the difference between national accreditation and regional accreditation in: Accreditation: Understanding the Difference Between Real Schools and Diploma Mills. Regional accreditation is given to an overall institution, not to individual departments or degree. Unlike other fields (e.g. sociology), there is no separate accrediting body for history programs. However, the American Historical Association does publish a Directory of History Departments, Historical Organizations, and Historians, which you may find helpful. If you’re interested in becoming a public teacher, you must be licensed as a teacher by your state. We talk more about the licensing process, options for teaching degrees, and the importance of CAEP/TEAC/NCATE accreditation in our article on K-12 Education. You’ll find that some combined history/teacher education programs are happy to prepare you for state licensure. But if you only have a bachelor’s degree in history, you will need to think about enrolling in a teacher certification program. To maintain certification, archivists must provide evidence of continuing education, experience, and professional participation.